Greenwich is known for the Greenwich Mean Time, the standard to which all the clock-times are compared. Greenwich also houses a Maritime Museum, the Royal Naval College, the Queen's House and the Cutty Sark. 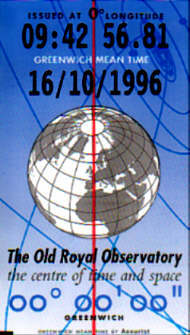 The Observatory is housed precisely at the 0 degrees longitude. The 0-longitude is laid out in stones, so you can stand with one foot in the Eastern half and with one in the Western half of the world. In the Observatory you can find the history of clock making and of defining time on a ship, quite a hard task before the spring as a driving mechanism was developed. Since it is essential to know the time to find the longitude where you are, it is not a wonder the most curious things where tried to keep track of time. For instance: the dog on board of the ship that yelped when its brother on land was kicked was very popular for some time. 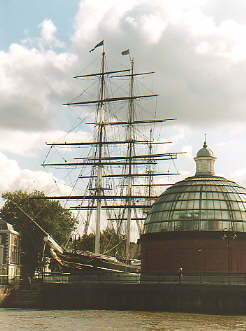 The ship is the Cutty Sark, the fastest clipper that was launched in 1869. It was used for the China tea trade. In 1922 she served as a nautical school, and in 1954 she retired. Now you can visit her in Greenwich. Another famous boat in Greenwich is the Gipsy Moth, a catamaran in which Sir Frances Chicester on his own rounded the world in 1966-1967. The dome in front of the Cutty Sark is the end of the foot tunnel to the other side of the Thames, where there is a dome just like it. It is a nice trip to take the Dockland Light Rail to the end of the Isle of Dogs, and then walk through the tunnel to Greenwich. You can take the boat back to central London. 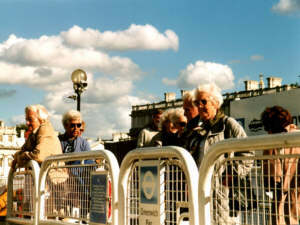 You will probably be accompanied by lots of senior citizens (or senior tourists).